It’s a year-long celebration of flavor and beauty as we honor and grow the beet, coreopsis, calibrachoa and tulip. The National Garden Bureau (NGB) has declared 2018 the year of these garden mainstays. This non-profit’s goal is to inspire you to grow these and more plants in your gardens at home and work. The celebration starts with the tulip, a symbol of spring. They come in a variety of flower types and colors. Select from early bloomers like Apricot beauty and end spring with a late blooming double tulip like Backpacker. Then add some pizzazz with more double blooms, ruffled petals of parrot, pointed flowers of lily types or fringed tulips. Add more low maintenance beauty to your garden with the other two National Garden Bureau “Year of Flower” designees. 2018 honors the annual calibrachoa and perennial coreopsis. Once you grow calibrachoas you’ll know why it has become a gardener’s favorite. You’ll appreciate the wide selection of colors and outstanding performance in containers. You may know these beauties by their collection or series names such as Superbells®, Million Bells®, Callie®, and Calipetite®. Fill a basket with these beauties or mix them with other flowers, vegetables and herbs. Dress up a pot of elephant ears or base of trees with calibrachoas, cascading over the edge of the pot. The only challenge you’ll have is deciding which one of these colorful plants to grow. Grow a bit of sunshine in your garden with coreopsis. No matter where you garden or your gardening style you can find a coreopsis that fits the situation. Enjoy the long blooming, small yellow daisy-like blooms and fine foliage of threadleaf coreopsis (Coreopsis verticillata). Include these versatile plants in natural, informal and even formal garden settings and containers. The towering tall coreopsis (Coreopsis tripteris) brightens the back of the flower border with its yellow daisy like flowers from mid summer into fall. Try a few of the newer coreopsis introductions with larger blooms and different colors. Big Bang Cosmic Eye has bright yellow flowers with dark red center, while Coreopsis ‘Ruby Frost of the Jewel Series has ruby-red flowers with a fringe of frosty white. Dress up your dinner table with the NGB’s edible of the year, beets. Not only are they tasty and pretty, but they’re also good for you. These small vegetables are high in fiber, vitamins A and C, have more iron than most vegetables and are rich in antioxidants, calcium, potassium, phosphorus and folic acid. Use beet greens in salads and roast, cook or juice the colorful roots. Change things up with yellow and gold beets like Touchstone Gold. It’s vibrant orange-red exterior and golden center will add something special to any dish. Entice those reluctant to eat beets to the table with All-America Selections winner, Avalanche. 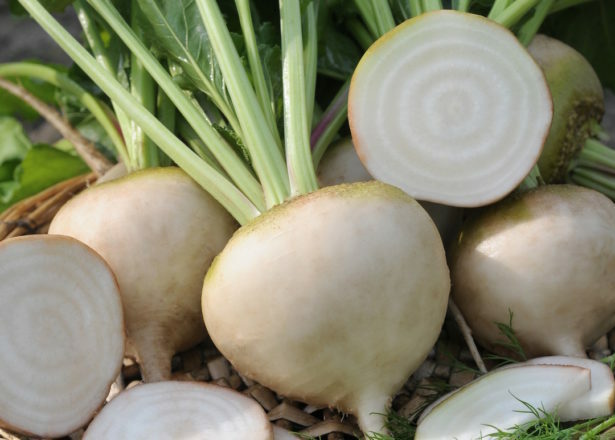 The snow-white root has all the sweet flavor of the beet without any bitterness or earthy flavor that may have discouraged them in the past. Then visit the NGB’s website (ngb.org) for creative and tasty ideas for adding beets to your meals. Chef Jonathan Bardzik shares fun and easy recipes and a video to help you brighten your meals with beets. Join the fun and add these 2018 National Garden Bureau designees to your containers and gardens. Then share the beauty and flavor with friends and family throughout the growing season. Cutline: Snow white colored Avalanche beet has all the sweetness but lacks the bitterness of some other beet varieties.